Richmond is the administrative centre of the Richmond shire (26,936 sq km), 620 km west of Mackay and 110 km west of Hughenden. Four hundred kilometres to Mount Isa's east, Richmond is close to the geographic centre of north Queensland. Richmond is on the Flinders River, Queensland's longest watercourse with its headwaters about 200 km north-east of Richmond which flow in an arc to the Gulf of Carpentaria, near Kurumba. The town is also on the Flinders Highway and the Great Northern Railway, both starting from Townsville passing through Richmond to Cloncurry. William Landsborough explored the Richmond district during his 1862 search for the Burke and Wills exploration party. Pastoral settlers first took up runs in the more accessible districts of Winton and Hughenden. Eventually in the late 1870s Arthur Bundock and Walter Hays took up the Richmond Downs run, named after Bundock's birthplace on the Richmond River, in northern New South Wales. At about that time there was a rush on an outlying part of the Etheridge gold field at Woolgar. Richmond, still no more than a coach stopover where the inland track met the Flinders River 120 km to Woolgar's south, became an important transit point for coaches ferrying miners north. In 1882 a township was surveyed at the coach point (itself named after the Richmond Downs). Within ten years the post office directory recorded three hotels at Richmond (Royal, Star and Garter, Western Star), along with a provisional school (1889), three stores, a baker, butcher, two blacksmiths and a saddler. 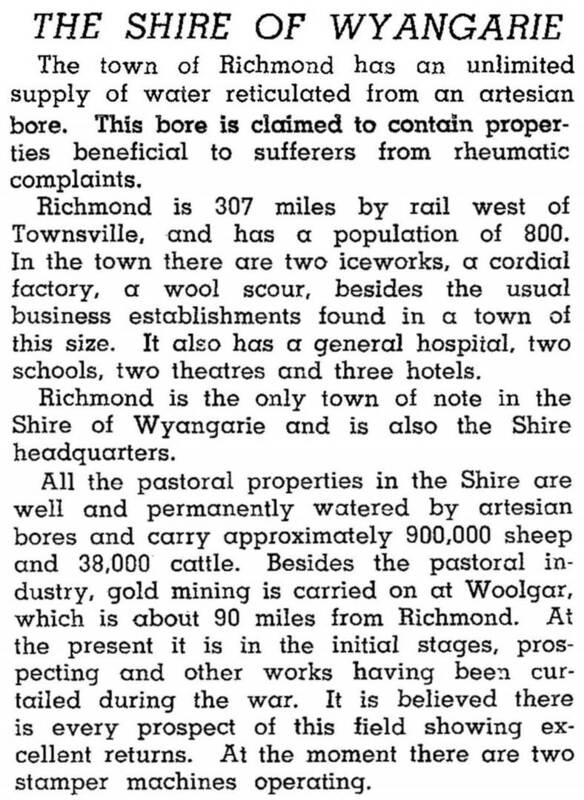 By the time the Great Northern Railway reached the town in 1904, Richmond had nine hotels, a hospital, the Richmond Record newspaper, the Queensland National Bank and a wool scouring works. Pastoral stations abounded in the surrounding district. The town's population increased by half to over 900 people in the period from 1910 to 1930. Although the number of hotels had diminished, there were Church of England, Presbyterian and Catholic churches, along with a convent primary school, the Strand cinema, the Richmond Race Club and a growing number of motor garages (five by 1949). Outlying pastoral stations numbered 40 or more in 1949, their interests represented by the Richmond Graziers Association. St John the Baptist Church of England, built in 1909, is listed on the Queensland heritage register. Richmond has not been spared from the population declines experienced by most Western Queensland settlements in the late twentieth and early twenty-first century. Over 1000 in 1961, by 1991 the town's population had declined by a third. Whilst the pastoral industry still dominates the economy, Richmond's position on the inland tourist route has been capitalised on in recent years. The area once formed part of Australia's ancient inland sea, and is home to a rich bed of dinosaur fossils. Remains of Kronosaurus queenslandicus, a predatory marine reptile, were found by a Harvard paleontology team in 1929, and in 1989 a further major discovery was made with the discovery of a 100-million year old pliosaur on nearby Marathon pastoral station. The disused Strand cinema was converted into a museum ('Kronosaurus Korner') in 1995. The premises have been enlarged with display and research facilities, and there is an outdoor display of locally found limestone boulders known as 'moon rocks'. In 2010 dinosaur fossils (vertebrae from the ichthyosaur) were unearthed at the Richmond State school. Richmond has impressive plantings of native and bougainvillea shrubs: it won the 2001 tidy-towns award. There are golf, bowls and swimming facilities, a race course that has seven meetings a year, livestock saleyards, two hotels, two motels, a caravan park and a tourist information centre. Richmond also houses Queensland's only sandalwood mill, manufacturing products for export to Asia. The town's origins as a transit point on the Woolgar goldfields coach route are remembered by the name of the main street, Goldring Street, in which can be found a restored Cobb and Co coach. The Richmond Shire is bisected by the Flinders Highway/railway corridor. It was originally known as Wyangarie Shire (1910), until renamed in 1954. Agriculture and pastoral activity - divided in 1992 between sheep and lambs (360,000 head) and beef cattle (146,700) - were the shire's dominant industries. At the 2011 census coal mining was the dominant employment category in Richmond (7.8%).